It has often been said that in the 1920s and ’30s automakers built automobiles, but it was the coachbuilders who built the cars. In the case of every Bugatti this was a truism. The leading coachbuilders on two continents catered to the various Bugatti designed and built chassis for over 40 years, and created what could well be the most beautiful automobiles the world has ever known. 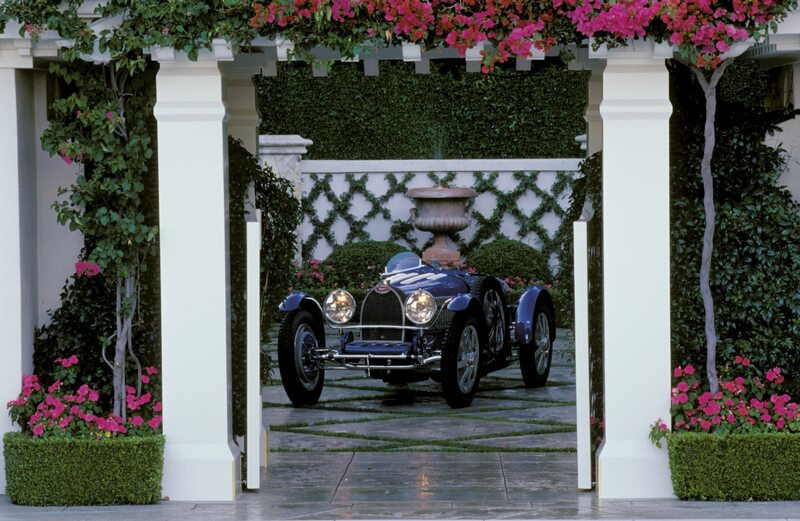 In the story of the automobile, Ettore Bugatti was one of history’s most colorful characters, someone about whom tales could be told and whose life was an open book scripted in a dogmatic and flamboyant style. Though Italian by birth, Bugatti spent nearly all of his life in France. From around 1910 to 1951, nearly 8,000 cars bearing the Bugatti signature were produced at the Molsheim factory located in the Alsace region. Hard to believe, but this is the same car with two different bodies, truly the quintessential definition of racecar and road car. There were 52 different Bugatti models produced over the years ranging from Grand Prix racecars—the famous Type 35—to the most luxurious and costly automobiles ever built, the Bugatti Royale. Somewhere between these two extremes was the Type 51, an automobile that could be both racecar and road car. It was merely a matter of coachwork. The chassis design for all Bugatti models retained a traditional and rigid architecture established by Ettore, this most notably being a solid rear axle suspended by quarter elliptic springs, and at the front an artistically striking solid beam axle pierced at its outer corners by semi-elliptic springs passing through the axle housing! 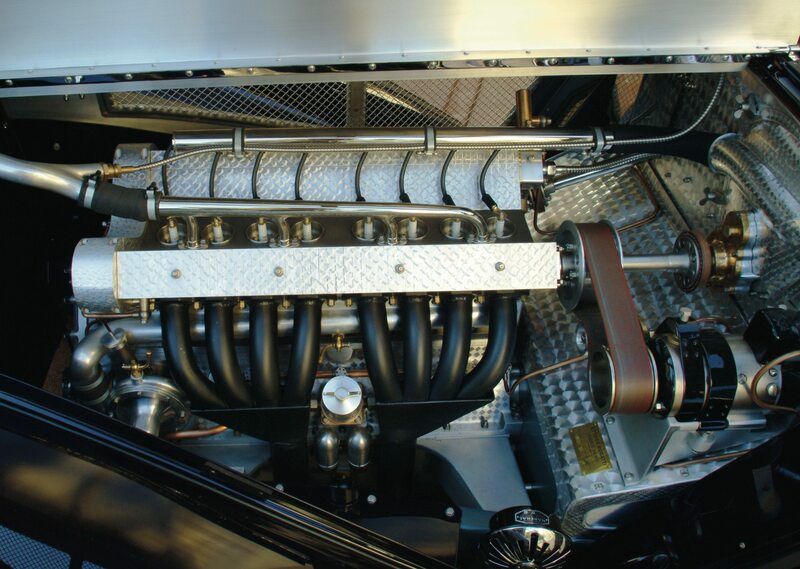 The Bugatti engine was a work of art, albeit simplistic art, as Roland Bugatti explained. The engine was an 8-cylinder inline with dual overhead cams, and a bore x stroke of 60mm (2.36 in.) x 100mm (3.93 in.) yielding a swept volume of 2.3 liters or 136.5 cubic inches. Output was rated at 180 horsepower. Engines, too, were awe-inspiring in their layout; unique in appearance, having squared housings with finely polished engine-turned finishes. The logic of this seemingly complicated design was debated for decades. Was it, as some had speculated, Ettore Bugatti’s acknowledgment of the Cubist Movement made popular in the 1920s with damascene-finished rectangular shapes, or was there a more practical reason for the unique appearance of his engines? According to Bugatti’s youngest son Roland, it was the latter. “The Boss (as Ettore was referred to) did not tolerate the waste of time, labor, or materials,” he told noted historian Griff Borgeson. “The factory workers were mostly the sons of farmers with few mechanical skills. Slab-sided construction and engine-turned finishes were the most simple.” Well, so much for the Cubist Movement theory. The Type 51 Bugatti were swift cars suited to virtually any type of road competition. Beneath the hood was one of the most powerful inline eight-cylinder engines of the 1930s, a supercharged 2.3-liter (136.5 cubic inch) dual overhead cam motor capable of developing 180-horsepower. 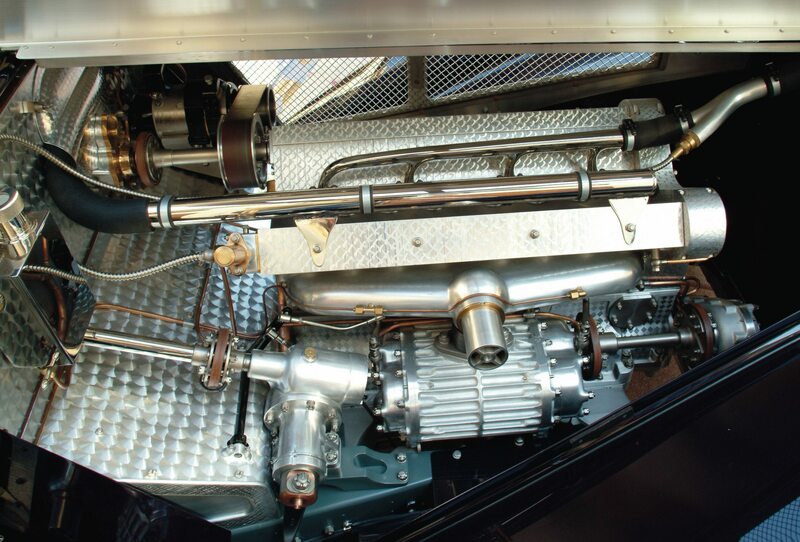 The Bugatti-built gearbox was almost unbreakable, and the massive mechanical brakes adequate to the task of scrubbing off speed until they overheated, the one weakness of most early Bugatti racecars. 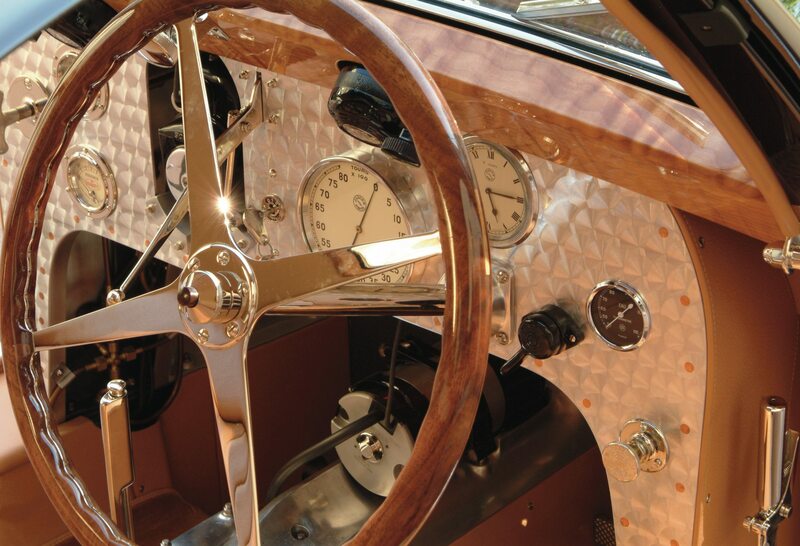 The breathtaking Louis Dubos (pronounced du-bow) coachwork for the Type 51 is remarkably similar to the Type 57SC Atlantic designed by Jean Bugatti. The body on this example, now in The Nethercutt Collection, is a one-off design by Louis Dubos. This, however, is the second body, the road car body if you will. 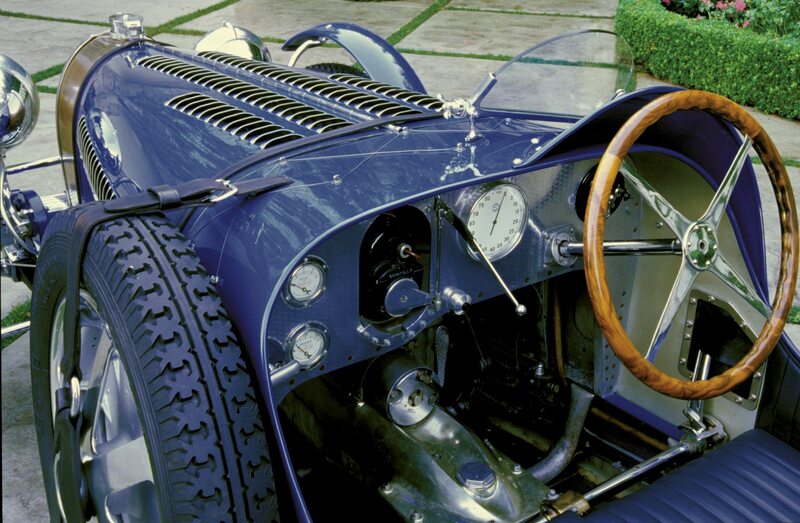 This Type 51 was originally fitted with a Grand Prix body and campaigned by the famous French race driver Louis Chiron. This Grand Prix was the traditional racing style Bugatti of the era, a narrow fuselage with a small cockpit for the driver and riding mechanic. The cars were prominent in appearance with their unmistakable horseshoe grilles and bright Bugatti blue paint. Chiron drove for Bugatti during the 1931-racing season, after which “The Boss” gave him the Type 51 GP car. Chiron campaigned it for another season and then sold it to sportsman André Bith, the heir to a French pharmaceutical fortune. Bith drove the Grand Prix in rallies and sporting events until around 1937 when he retired the Bugatti from competition and, it still being in very good condition, had the Type 51 chassis fitted with new coachwork. 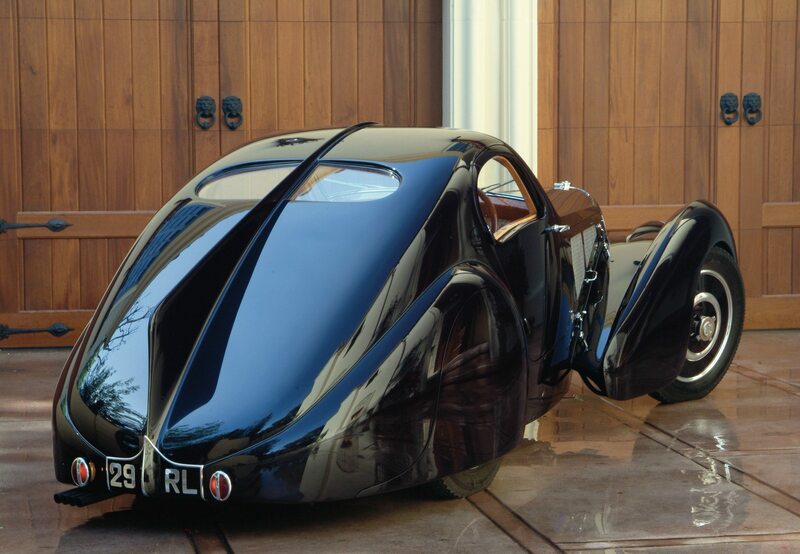 He went to Carrossier Louis Dubos at 7 et 9 Rue de Sablonville, Paris to inquire about having a body built in the style of Jean Bugatti’s exciting new Type 57SC Atlantic. 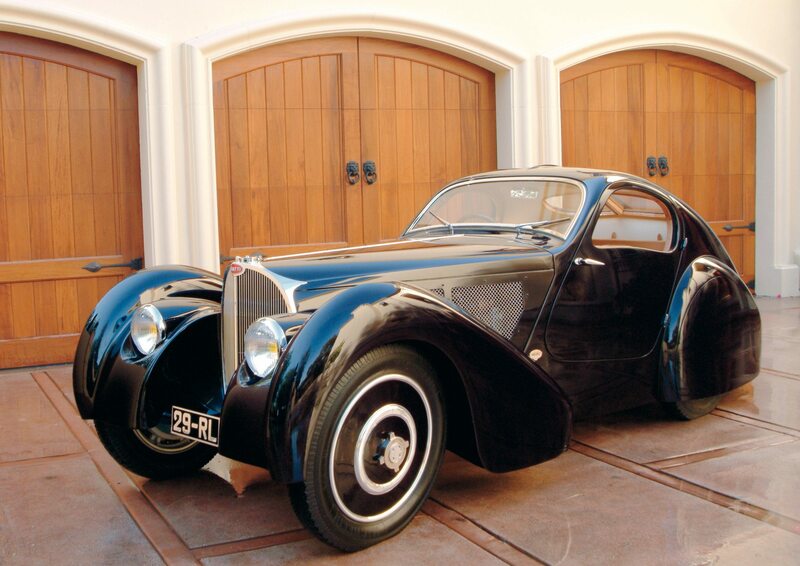 Bith was a close friend of Jean Bugatti and was very impressed with the dramatic look of the aerodynamic coupé. With the Atlantic as his guide, Dubos began work on the car April 2, 1937 and delivered the rebodied Type 51 to Bith on July 20. The long bodylines on the short Type 51 wheelbase create a very dramatic stance with so much of the body’s visual power focused on the fenders. The new body was exactly what Bith had wanted, a short wheelbase Atlantic. He entered the car in the 1937 Bagatelle Concours d’Elegance, where it was shown by Madame Jacqueline Ganet, the reigning Miss France. The Type 51 was awarded 2nd overall. 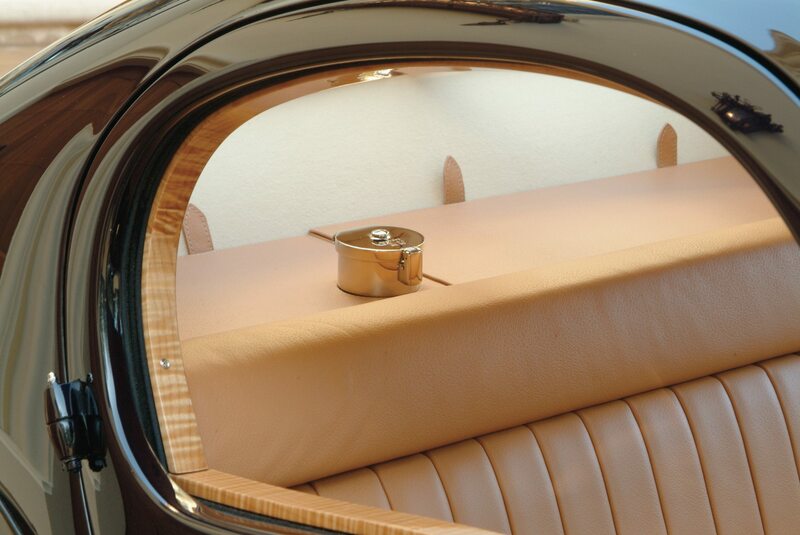 This was perhaps a prophetic finish for the Bugatti in its first Concours d’Elegance. Bith sold the car prior to World War II and it simply vanished. 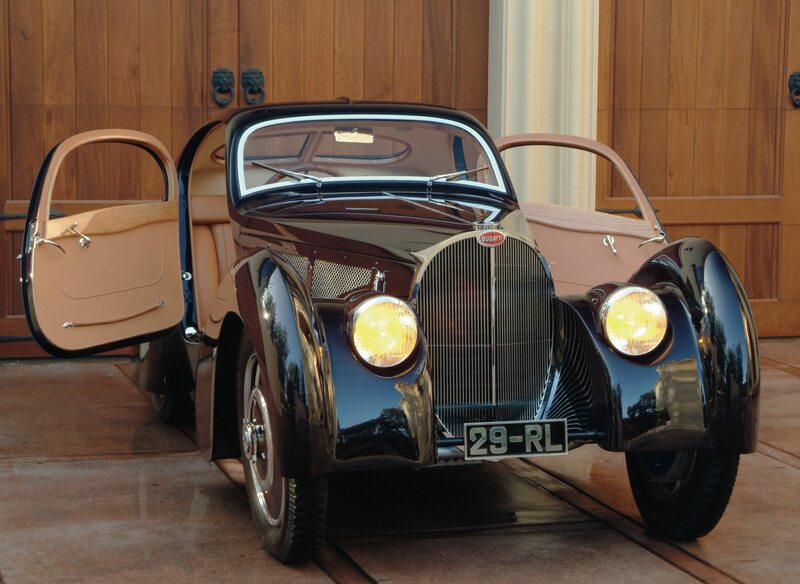 Miraculously the Bugatti survived the war and was acquired by American Gene Cesari in the early 1950s. Mr. Cesari removed the Dubos body and refitted the chassis as a traditional Type 51 Grand Prix racecar. The Coupé body was sold to another collector who mounted it on a made-up Type 51 chassis, and the car disappeared once again. The Type 51 restored Dubos Coupé body. When J.B. Nethercutt purchased the Chiron Type 51 in 1959, the second Grand Prix body was gone and all that remained of the original car was the bare chassis. 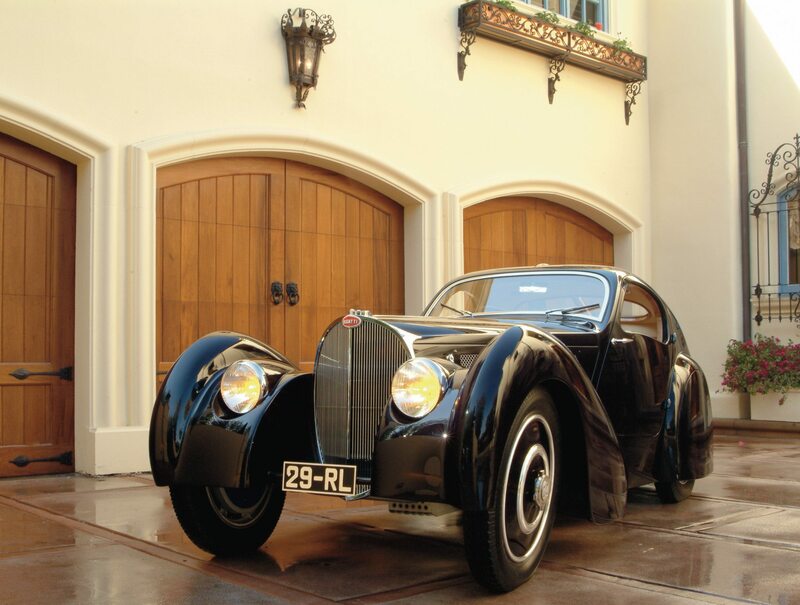 He turned to internationally renowned Bugatti authority and restorer O.A. “Bunny” Phillips, who built another Grand Prix body for the Bugatti, identical to those campaigned in the early 1930s. 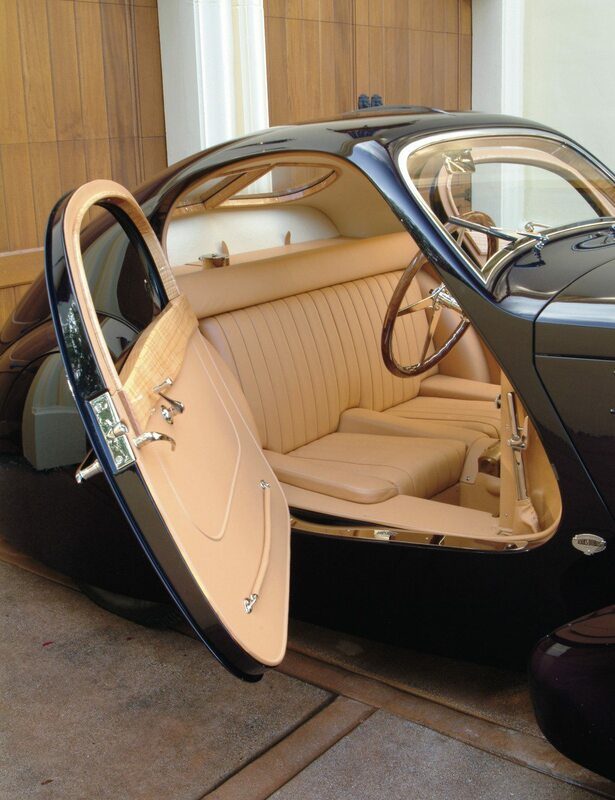 The Type 51 became part of J.B. Nethercutt’s personal collection and no one thought again about the Dubos Coupé body until it surfaced at auction almost 40 years later, in August 2000. For years in had been in the Bob Sutherland collection outside Denver, Colorado. But even Sutherland had no idea where the original Chiron Type 51 chassis was. It was just prior to the auction at Pebble Beach that J.B. Nethercutt’s staff discovered the museum owned the original chassis, the rebuilt Type 51 Grand Prix car that Mr. Nethercutt has purchased in 1959! The Museum subsequently purchased the Dubos at auction, and the body and chassis were reunited and restored—together for the first time in more than half a century! The same yet different…the engine-turned Type 51 dash panel, instrumentation and controls never changed over the years, just everything around them. The restoration of the car was extensive, even though the entire Dubos body was in tact. 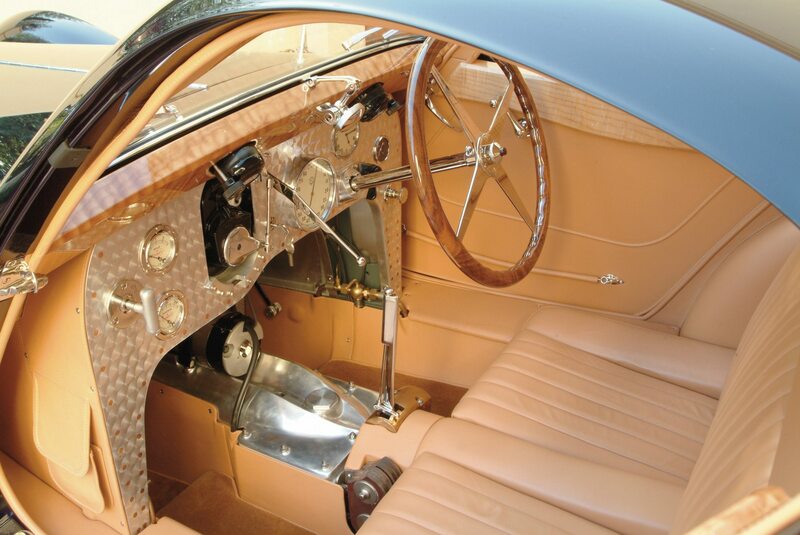 The Nethercutt restoration shop pursued every avenue of research in terms of finishes, materials, and particularly the instrument panel, which always retained its racecar design. 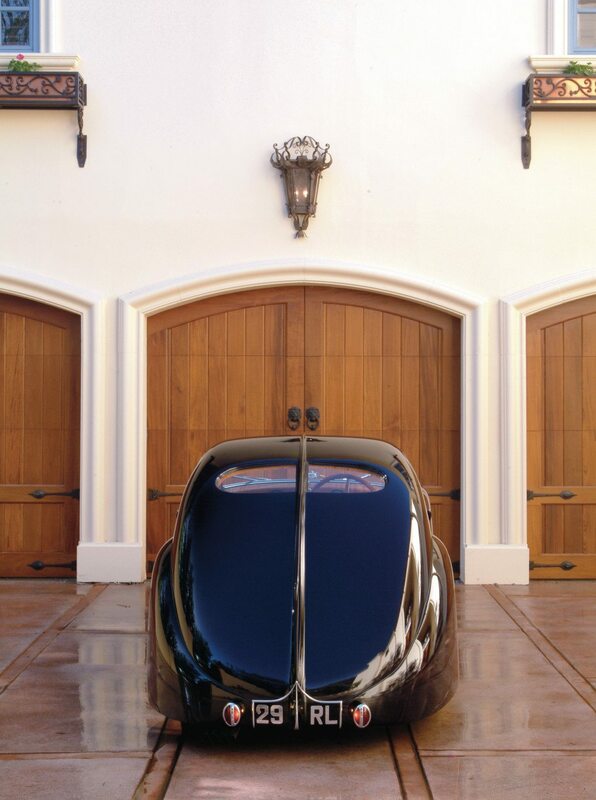 Having the original chassis already restored under the Grand Prix body certainly expedited the restoration process and in 2003 the Bugatti Dubos Coupé made its debut at the Pebble Beach Concours d’Elegance. 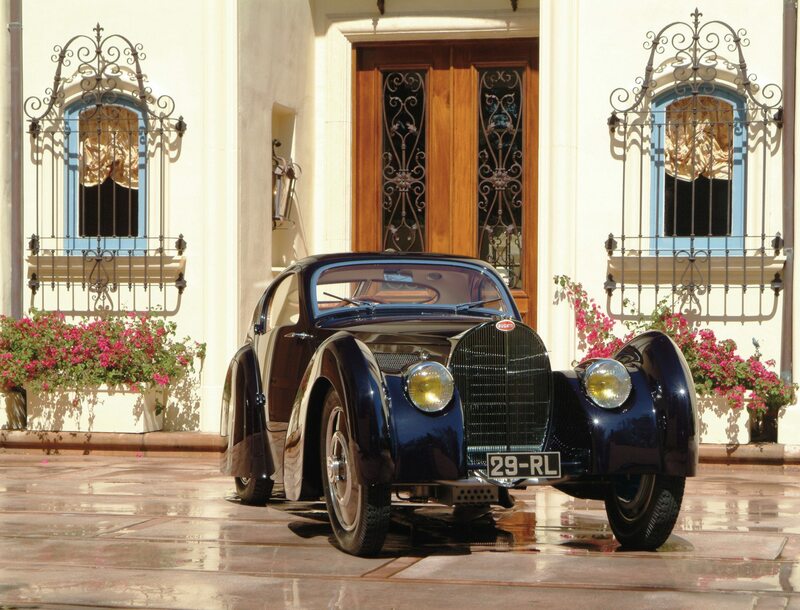 Unfortunately, this was the same year that two of the Type 57SC Bugatti Atlantics were shown, and although a favorite among many, the Type 51 Dubos Coupé was trumped by the very car that had inspired its design in 1937. One of the Atlantics won best in class and went on to win Best of Show, leaving the Dubos with honors as second in class, just as had happened at the 1937 Bagatelle Concours d’Elegance. The Dubos also won the prestigious Pebble Beach French Cup for the best car of French origin, which on that day it no doubt was despite the pair of Type 57SC Atlantics. Just plain sinister looking is the only way to describe the Dubos Coupé from the rear. Today the Dubos is the centerpiece of the new Nethercutt Museum, located across the street from San Sylmar. Still capable of speeds reaching 140mph, Type 51 is a formidable sports car, even by 21st century standards. Aerodynamic styling of the Dubos Coupé body extended to the doors, which are steeply angled and hinged at the back. Getting into and out of the car was harder than it looks. 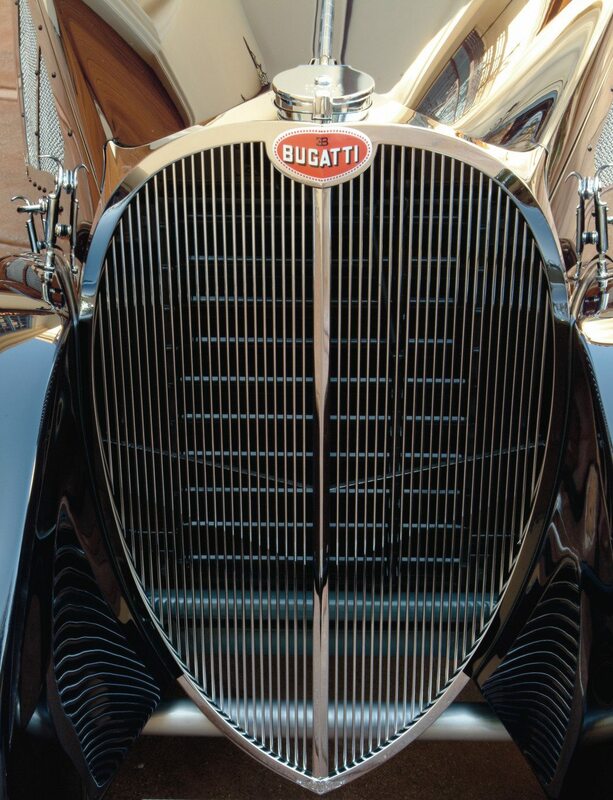 The Type 57SC-style Bugatti grille, in this case a slightly vee’d shape, was the most beautiful interpretation of the traditional horseshoe design. 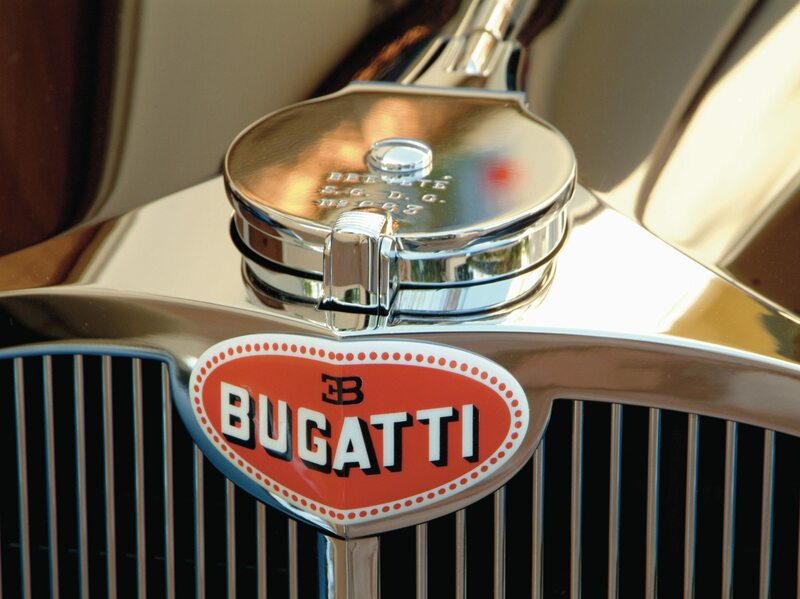 Everything about a Bugatti is beautiful, even a radiator cap or cloisonné grille emblem. Another thing that never changed was the fuel filler, originally on the right rear cowl. It’s still there, only now it’s inside the car! This makes fueling quite a chore and you have to wonder what Louis Dubos was thinking. 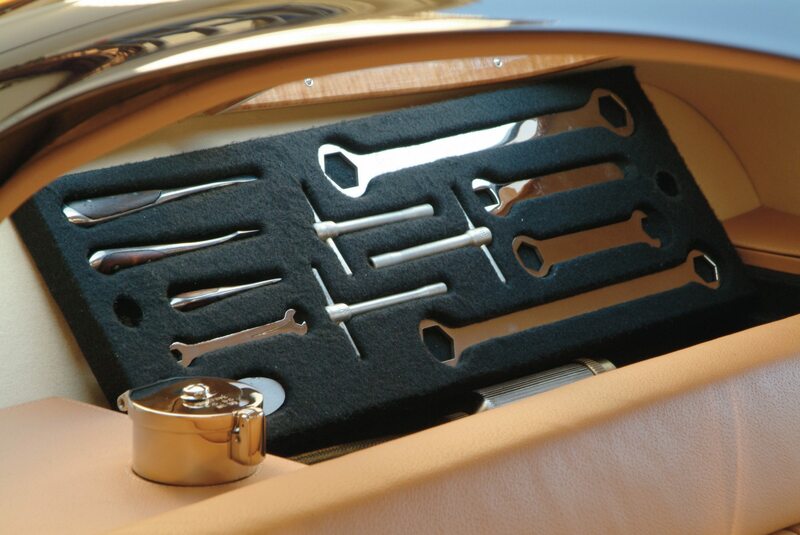 The tool kit is now housed inside the shelf behind the seats. 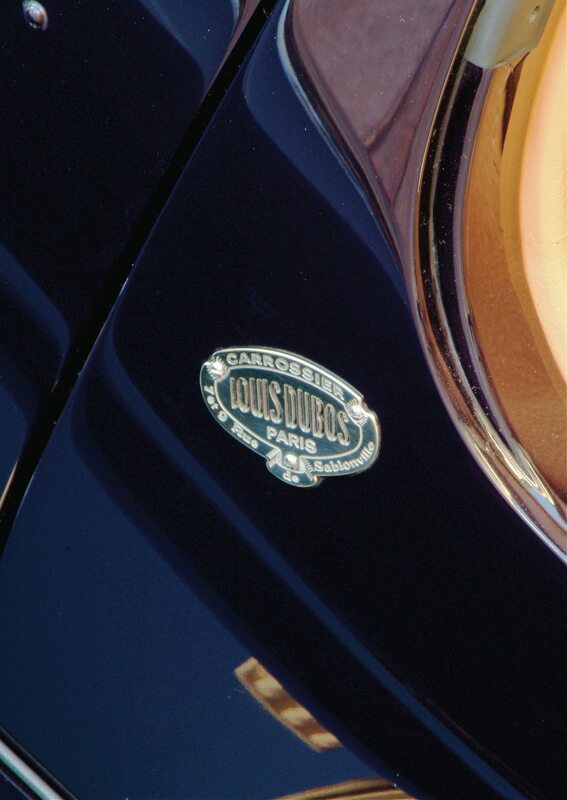 Louis Dubos coachbuilder’s plate was on the original body when it was purchased from the Bob Sutherland estate at auction in August 2000. 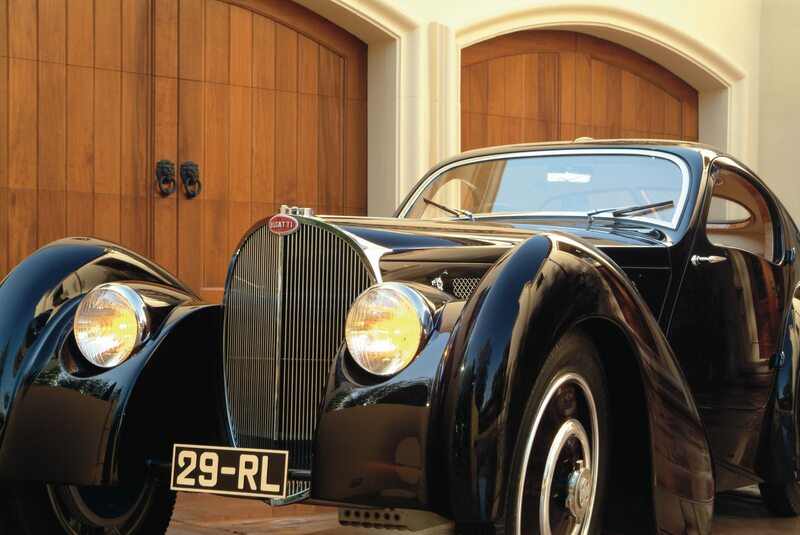 If you have an early model Bugatti or another collectible you’d like to insure with us, let us show you how we are more than just another collector vehicle insurance company. We want to protect your passion! Click below for an online quote, or give us a call at 800.678.5173.